Chanteur Country US né le 14 Mai 1903 à Hardinsburg (Kentucky). Jenks "Tex" Carman est décédé le 2 Février 1968. Jenks Tex Carman was one of the more dubious but interesting talents ever to achieve stardom, however fleeting, in country music. A player of great dexterity but severely lacking in any sense of rhythm, and even more lacking in a voice, Carman succeeded on the basis of the sheer enthusiasm of his performances, achieving some respectable record sales and a national following based on his television appearances. Jenkins Carman was the seventh of eight children born to Alford Carman and his wife. They were a farm family with a great love of music — throughout his career, Carman also claimed part Cherokee ancestry, and tried to emphasize this by wearing Native American regalia in some of his public appearances and later album cover art. By age 12 he was on his way to becoming an accomplished guitarist, and he left home in his teens to pursue a career in music. He started out in vaudeville and playing Chautauqua shows, and by the end of the 1920s had emerged as a solo-guitar novelty act. He cut a pair of songs in late 1929 for the Gennett label in Indiana, but neither was ever issued. 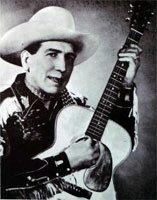 In the early '30s, he hooked up with Hawaiian guitar virtuoso Frank Plada, who taught Carman the basics of Hawaiian guitar technique. This instrument became the core of Carman's music from the early '30s onward, and it was using the unamplified acoustic Hawaiian guitar, hung from his neck and fretted with a steel bar, that he began making a name for himself in country music. By the late '40s, he had signed to the Four Star label and begun recording under the name Jenks Tex Carman, "the Dixie Cowboy," as well as appearing on local radio. Soon after, he started to perform regularly on television on the country music showcase Town Hall Party, hosted by Tex Ritter and Johnny Bond, and later still became a regular on Cliffie Stone's Hometown Jamboree. 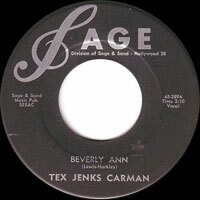 His contract with Four Star ended, and Stone brought Carman to Capitol Records and producer Ken Nelson in 1951. 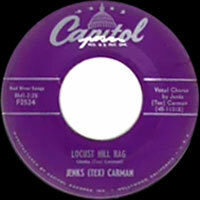 Carman's Capitol recording career lasted from April of 1951 until December of 1953, and despite some very uncomfortable moments in the studio, he generated some choice sides — "Hillbilly Hula" was his most famous and requested song, a number he featured on his television appearances, but other highlights included "The Caissons Go Rolling Along" and "Locust Hill Rag." The backing personnel on these cuts is not known, although essayist Cary Ginell believes that Joe Maphis was probably one of the participants on electric guitar or banjo. Carman never acquired much more than a cult following through his records, but on stage or television he was a major attraction. The sheer wildness of his appearances and the unbridled enthusiasm of his work made him a continuous showstopper, despite his inability to hold a beat or hit a cue. The sales of Carman's singles were too low to justify the renewal of his Capitol contract, and after a lapse of several years, he signed to the small Sage & Sand label, even as he continued to work on television as a regular on locally produced variety series. His later albums tended to emphasize his unverified claims to Cherokee ancestry, which were reinforced by his unusual physiognomy — as one onlooker recalled, Carman dressed like a cowboy and looked like an Indian; occasionally, he even donned a feathered headdress. Carman's last album was called The Ole Indian, released by Sage & Sand in 1962. By the mid- to late '60s, he had retired after a 40-year career in music. 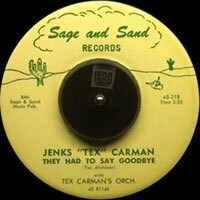 Jenks Tex Carman was not in a league with the best steel or Hawaiian guitarists, and his Vocals skills were even more limited. He was a master showman, however, and accomplished with sheer enthusiasm and reckless abandon what he couldn't do with technical skills or musical instincts. 1951 78 t. 4 STAR X-6 (US) . 05/1951 SP CAPITOL F-1571 (US) . 10/1951 SP CAPITOL F-1822 (US) . 04/1962 SP SAGE 45-351 (US) . 04/1962 SP SAGE 45-352 (US) .